Free HTML5/ CSS3 template designed to satisfy the needs of all food related businesses. That’s an outstanding website template, built with creativity and innovation in mind. Be sure that by using our Cafe / Restaurant template you will grab the attention of your visitors. We have used the latest HTML5 and CSS3 techniques to produce this contemporary creation. The code is properly structured and commented so you need just some basic skills to change the logo, text and images. 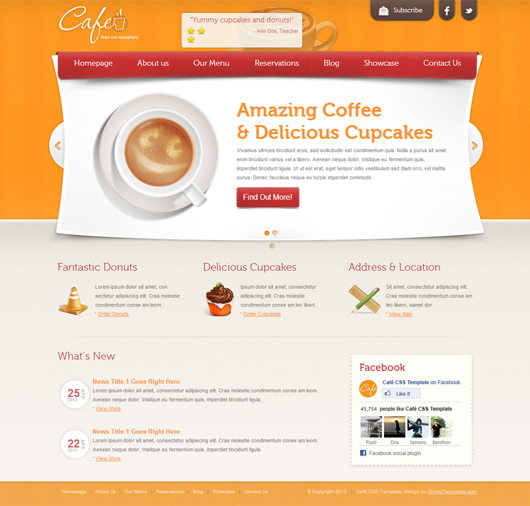 Download the Cafe / Restaurant template now for free.